ummmm OUT OF CONTROL! Like, talking to me from the kitchen good. Commmmme EAT ME NOW good! Definitely had way too many good. I mean I am the head taste tester and all- SOOO I had NO choice. PLUS SO SIMPLE! Double boiler, dark chocolate, butter, and a TINY splash of 1/2&1/2! These will def be at her party! UPDATE: FREEZE THEM! Seriously... place them in the freezer and OMG INSANE TIMES A MILLION! Seriously amazing, this is my first time ever having them- and OH MY GOSH GOOD! Loooove choco chips...beat choco pretzels in my book hands down (and I love choco pretzels)!! Oh my gosh. I am sold. Must.Try.Tomorrow. Looks like the best PMS food evah! This is one brilliant idea whose time has come. 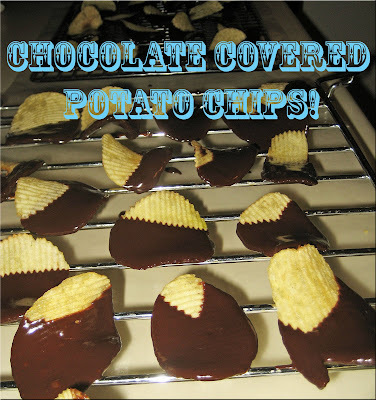 chocolate dipped chips are super delicious! Salty + Sweet means I am DEF going to have to try these babies! !